For many years, brothers have been visiting Cambodia. As early as in the difficult times of the 1970s there was a discreet presence. Since 1992, there have been regular visits for prayers and retreats — sometimes for one diocese, sometimes for the 3 Dioceses together. In 2015, The FABC Youth desk invited the brothers to lead a retreat for youth from Thailand, Laos, Vietnam and Myanmar. 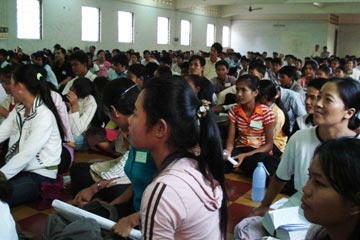 It was held in the Pastoral centre of Phnom Penh. One afternoon the young people visited some places of hope. One of them tells here about a visit to St Elisabeth’s House, one of the projects supported by Operation Hope. 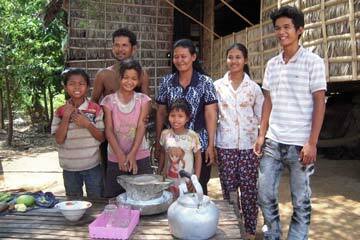 Tahen is a village near Battambang in the North West of Cambodia. 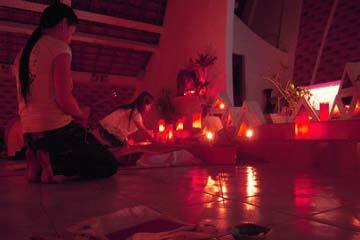 Last year, a young man from Tahen spent three months in Taizé. During our journey in Cambodia we wanted to visit him and the other young people in the village, and to join together in an evening prayer. When we arrived, we quickly realised that this was a special day for the people of Tahen. Everything was decorated for the feast — many people were wearing traditional costumes, coloured flags were out along the streets of the village, the parish kitchen was in full activity and tables and chairs were set out for a great dinner. This was Monday 19 March. The Catholic parish of Tahen were celebrating the feast of Saint Joseph, patron saint of the church. For us it was something quite unique to be able to celebrate this day with all of them. The parish is alive today, thanks to a courageous woman. During the dictatorship of the Khmer Rouges in Cambodia, the Christians were harshly persecuted. The woman prayed with her children and in this way transmitted the faith, which continued in the village. Now she is very old and can no longer come to church. We started the festival with a short prayer at her home so that she could take part. During the celebration, dances with brightly coloured traditional costumes continued in the church, again and again, even during the Our Father. It was a very special moment. The young people danced the Our Father and some of them were in wheel chairs and joined in the circle with the others. 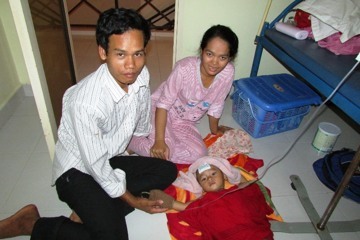 Many of them are victims of the land mines; this is a major problem in Cambodia. Each year there are 300 victims. During the dance of the Our Father it was quite clear that we are all children of the one Father, each one with his or her own gifts and capacities. Following the festive dinner in front of the church, the evening prayer began in the church with songs from Taizé translated into Khmer, the national language of Cambodia. Groups of young people from other places came to join in the prayer, until finally the church was too small. Many prayed outside in the covered courtyard of the church. On our way, we first of all passed through the neighbourhood of Kompong Cham and the village of Chomlak. There, the church is decorated with frescos representing the life of Jesus. Before the prayer began, we looked at the paintings with the young people. They also present scenes from daily life in Cambodia. Jesus and the disciples are wearing every day garments of Cambodia so that we can quickly understand that the message of Jesus touches each one of us and that he wants to transform our lives by his presence. For some of the young people there the Gospel is quite new and who are preparing for baptism. Adults from the parish and young people from other places had been invited to take part in the prayer. By the narrow road that goes through the village, jeeps, minibuses and trucks arrived from all sides, laden with young people waving their hands before running joyfully into the church. The church soon was filled to overflowing like in Chomlak, and many took part outside in front of the church. To the South of Phnom Penh, the capital of Cambodia, we went to Kampong Som for an evening prayer, and in Phnom Penh itself, in the parishes of Svay Pak, Champa and Pshar Touch. Everywhere we went we were received warmly and with great joy. The young people had prepared everything well, often setting up a small choir or orchestra for the evening. They were joined by musicians of the Evangelical Church. During our journey we met the widest possible variety of people: children and young people who take an active part in the life of Christian communities, disabled people and their friends who are committed to each other so that everyone can live in dignity and joy. ; the old lady at Tahen and others who continue to live their faith in very difficult conditions; people whose curiosity has been awakened by the witness of Christians and who are now preparing for baptism, to become part of the community of the Church; and many others besides who make the Church a place of joy, hope and community for everyone. Full of gratitude for all of this, we look forward with joy to the visit of the young Cambodians to Taizé this summer; they will certainly speak of this joy and hope to many others. “We certainly found new joy”. 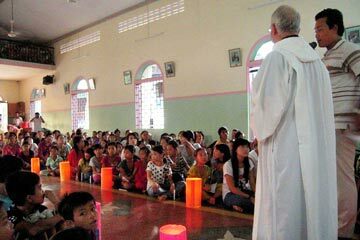 Brothers from Taizé were back in Cambodia in April 2011. One of them shares some of their experiences. “Ubi Caritas et amor, Deus ibi est”. What a surprise to hear this song from Taizé here in Kampong Ko, a tiny village close by a river near the town of Kampong Thom in the centre of Cambodia. We have been welcomed by a priest friend there who invited us to come with him for Sunday Eucharist. It took us 45 minutes by car to get here, passing through the village where Pol Pot - the leader of the Red Khmer who brought so much suffering to the country – was born. Later the road became very narrow, we passed rice fields, saw the cows enjoying taking baths in the ponds and finally arrived at the church. Before the difficult time of the Khmer Rouge, there was a church built of stone in this village; even a hospital and a school. Then everything changed. The church was destroyed, Christians were faced with violence and threaten with death, and many suffered martyrdom. Now there is no electricity in the village, the river water is used for everything: to wash clothes, to take a bath, even as a source of drinking water. Illnesses related to this are not unusual, explains the priest. Many people have not learned to read and write. 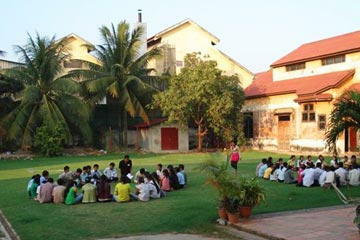 So the parish took the initiative to build a school on the parish ground. Hope for a better future. Life is not easy here and yet we found so much joy. A young man of the parish, who leads the choir, was waiting for us. 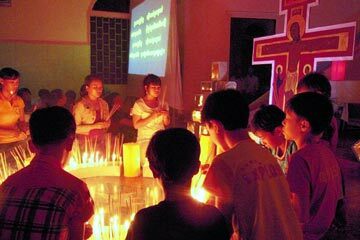 Some of the young people know Taizé because there were regular prayers with the songs in their student hostels in Phnom Penh. We were delighted to join in their prayers, to sing “Ubi caritas” with them during the intercession, and bring before God our hope for peace and justice in the world. After the Eucharist, two girls from the parish took us on a boat across the river to visit some of the families. What a warm welcome everywhere! We could not speak a lot, only few of them knew a little English, but there was always a smile, always a sign of joy. Among these poor people - who have to struggle each day for the basic necessities, through their fishing and their work in the rice fields -, we discovered something of what is written in the Letter from Chile: “Sometimes those who suffer poverty and deprivation are capable of a spontaneous joy in living, a joy that resists discouragement.” We certainly found new joy through our visit to this community. A few days earlier, south of the Cambodian capital Phnom Penh, we had met around 50 young people who had came together for leadership training in Kampong Som. At the present time, the church in Cambodia, after experiencing so much suffering and persecution, is on its way to being reborn. And it is evident that these young people are the future. 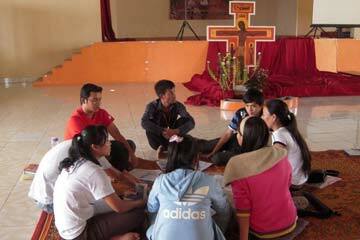 Each parish of the vicariate (diocese) had sent young people for this formation program. Some of them came from families who have been Christian for generations; others are just in the process of discovering faith. We had been invited to share a morning with them. Starting with a moment of prayer, with the Taizé songs sung in Khmer; then we continued with a bible reflection, a time of personal silence and then sharing in small groups. Each of the groups could choose one of the three themes of the Letter from Chile: “Joy, Compassion, and Forgiveness”. Before the noon prayer, some of the young people shared with all the others what they had discovered. We were happy to see how the desire for joy, the compassionate commitment for others and the longing to receive and to extend forgiveness is common to all of us. 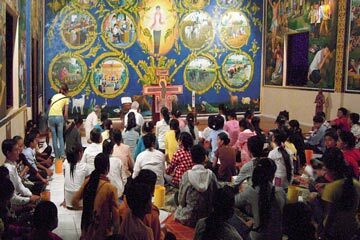 A few days later some of the young people joined us for a prayer in the BTP parish in Phnom Penh. 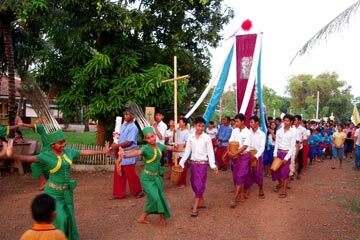 The parish youth and the choir were not at all sure how many people would come since this was the time when people in Cambodia celebrate the Khmer New Year. “Maybe only a few people will come, brother”, they warned us, so that we would not be disappointed. 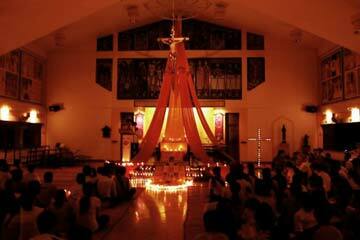 Nonetheless, they decide to prepare the church well, with icons, orange drapes, and a lot of candles. To everyone’s surprise many people came and in fact the church was full. The veneration of the cross continued for a long time and many were surprised by the great diversity of people taking part. Besides the young people and the young priests of the parish, there were also elderly members of the parish and sisters of religious congregations, as well as young people who have been preparing for three years for Baptism and will be baptised at Easter. There was also a small group with the pastor from the evangelical church, were regular prayers with songs from Taizé take place, a group of sick people from the nearby catholic home of St. Elisabeth, and the Bishop came as well. Here in the noisy, busy capital, as in the village close to the river, we discovered afresh the truth of the words that people sing and pray all around the world: “Ubi Caritas et amor, Deus ibi est.....” “Wherever there is Love and Charity, God is there. 2007: During the month of November, Brother Alois, accompanied by another brother, travelled in Asia, to visit the brothers living in Korea and to lead young adult meetings in several countries. As part of this journey, Brother Alois was determined to stop off in the country of Cambodia, where the Christians were heavily repressed during a dark period of recent history. The brothers were able to visit the country’s three dioceses, going first to Kompong Tom and from there to Kompong Cham, with the prayer at Phnom Penh as the last stage of the journey. Calling to mind the darkness that was not able to overcome the light, Brother Alois thought of the discussions that he had had, of the stories of the past, of the visit to Tuol Sleng, the old Khmer Rouge prison. He also had in mind his visit to Tan Kok, which has become a place of pilgrimage. It was there that the body of Mgr Salas, the young Apostolic Vicar, was found close to a pagoda, dead from exhaustion. Throughout this visit, it was clear that the light had not been extinguished by all the suffering experienced. Today, the two dimensions of prayer and solidarity are intimately linked in the life of the local Christian communities. In addition to the work of non-governmental organisations, there are a multitude of unobtrusive small initiatives that respond to immediate needs. 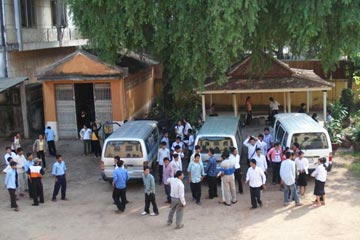 At Kompong Tom, in premises attached to the parish, a young lay person co-ordinates aid for the disabled, many of whom are victims of land mines. This is very practical help which aims to give back independence to people with disabilities, by providing them with a wheelchair, or with the minimum needed to start a small shop. At Ko Rokha, women with great family problems have been given a plot of land to cultivate, providing them with a small income and allowing them to rediscover the joy of working together – whilst they still retain such negative memories of collective work in the time of Pol Pot.